We are getting towards the end of summer, the next opportunity to take a fun trip might be during spring break. Let’s try to budget for a trip. I love taking trips – from a short weekend somewhere local to a multi-week journey, count me in! However, since I have small children, things just aren’t quite as simple anymore, and we will need to budget the amount of money we plan on spending. If we don’t take the time to set up a budget beforehand and save up some extra money we might find ourselves putting things on credit cards and creating debt, which is definitely not a positive! Let’s look at how to set up a travel budget by planning the forecasted expenses for transportation, hotel, food, entertainment, and souvenirs. 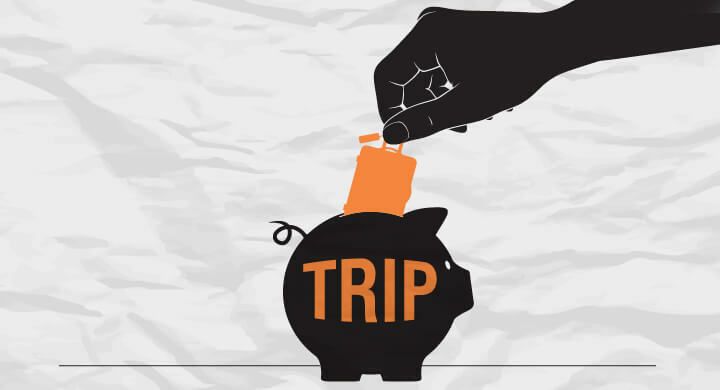 The first step to saving and budgeting for a trip is of course…saving money! Open a savings account specifically for your travel plans. You can easy open up a savings account with an online bank with $100 or less. Try having a yard sale and selling off some of your extra things to get a head start on your vacation fund. You could also take on some extra jobs from home such as mowing lawns or watching children to earn a little extra cash. There is frequently a need for babysitters for elementary school children from around 3PM-6PM, when the kids get off the school bus until the parents get home from work. If you have kids the same age it might be an easy way to pick up a few extra dollars a day to put into your vacation fund. Also try to cut spending where you can, such as limiting dinners out leading up to your trip. Frequently the most expensive part of a vacation can be the travel costs – a taxi to the airport, airfare, a taxi to the hotel, etc. For your vacation budget, include forecasted airfare, taxis, shuttle services, and any other expense related to transportation while you are away. The hardest part of this is to figure out what your airfare might cost months down the road, but try going online to research the rates for the times and destinations you are planning to travel. You can also try to see what the airfare rates were the previous year, it might help you determine what the costs will be the following year. Budgeting for hotel expenses is similar to airfare – it’s hard to determine so far in advance. Check the hotel rates were the previous year, it might help you determine what the costs will be the following year. If your budget comes up a bit short try to think of some extra ways to get more for your money such as using online coupons, joining a hotel loyalty program that earns you free nights, or even staying at a hostel. Finally, another huge expense for any trip is for restaurants, food, and drinks. If you are able to get a hotel that includes free breakfast you can fill up in the morning, and be able to eat a much lighter lunch. Then you only have to worry about a bigger expense for dinner. Also, try to limit your alcoholic beverages to just 1 or 2 with dinner. Some hotels even offer a free “cocktail hour” where you can get free wine, beer, and snacks. If you’re looking to travel, you will definitely need some luggage. DealDash has some amazing luggage that you can win for a great deal. Just click on this link right here and you can check out the luggage. Good luck and happy bidding everyone! This entry was posted in Uncategorized and tagged baggage, bags, budget, budgeting, Deal Dash, DealDash, DealDash Auction, dealdash auctions, dealdash.com, luggage, planning, travel, trip on August 23, 2016 by .